Have a sweet and tender spot for the fun and colourful carnival that is Mexican wrestling do you? 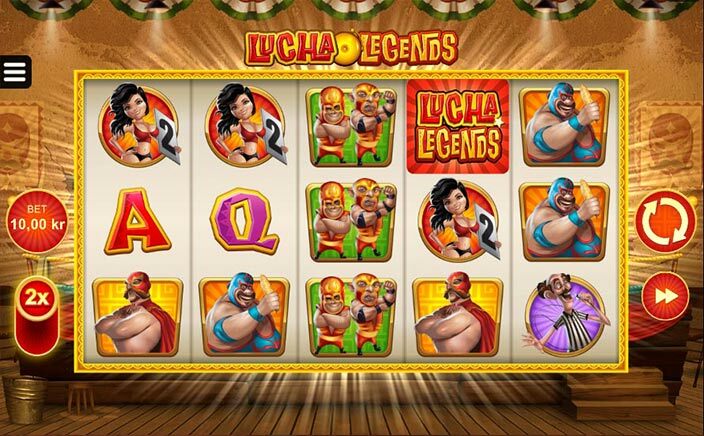 If so, then the Lucha Legends slot must have been specifically designed with you in mind! Made by Microgaming, this slots online features a squad of Mexican wrestlers, has a Free Spins round and a Power-Up mode where extra bonuses are made to appear. Read on up and get thoroughly familiarized with this fun and cartoonish creation. Begin to Rumble With Lucha Legends! 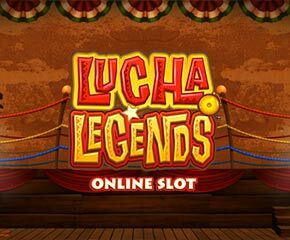 The Lucha Legends slot is a Microgaming developed slot with 5 reels and 25 paylines. Bets per spin are set at from 25p to ₤75 and the whole caper is cartoonish. A wrestling ring takes up space in the backdrop, with cheering crowds to be seen and a deadly mix of guitar music and trumpets to be heard. Featured as icons are playing card values, in addition to wrestlers like Martio, El Diablo, Burro, Pepe and duo Sal. There’s also a pretty ring girl who goes by the name of Violetta and a ref by the improbable name of Ricco. Also present is a wild, which replaces all the other icons apart from the scatter in Lucha Legends slots. Super Wild – this is a bonus feature that is activated at random in the base game. It results in the application of 2 extra wilds to the reels or slaps on multiplier values of from 2x to 3x to wins. This is just what happens during Normal Mode. When the Power Up Mode is activated, it results in a doubled stake, with bets per spin ranging from 50p to ₤75, rather than 25p to ₤37.50. In the Power Up mode, the Super Wild is boosted as it is more frequently activated and either adds a total of 4 wilds to the reels or boosts wins with multiplier values of from 3x to 5x. Free Spins – by landing a trio of the scatter icons simultaneously on the 1st, 3rd and 5th reels, the players are rewarded with 10 free spins. Getting 3 more scatters during this feature resets the remaining free spins to 10 while landing a single scatter leads to the award of a single free spin. All wilds that show up during the Free Spins round are made a Superb Wild, with win multipliers of up to 5x being applicable or 4 extra wilds being placed on the reels during each spin. The Lucha Legends slot is, to put it mildly, loads of good fun! Wins here max out at 2,200x the stake when the Power Up mode is activated.